– I’ve picked up this project again, briefly. It is a little broken (Arrest Warrant doesn’t work at all), I’ll be on and off fixing stuff in the coming months. 1.2 should have better performance, for starters. 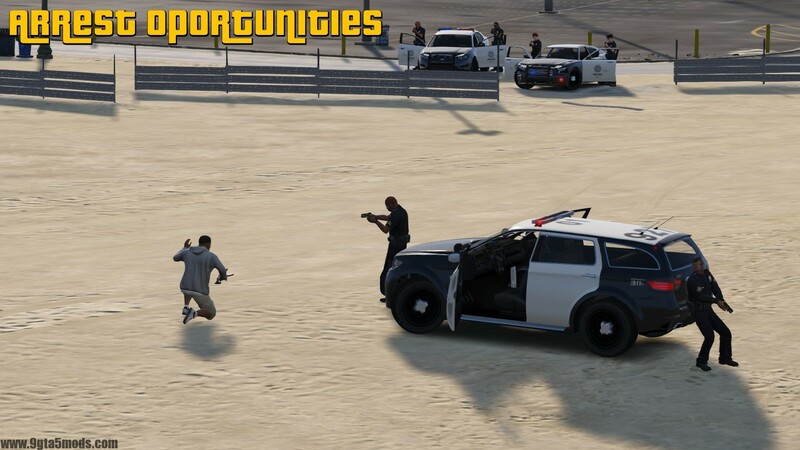 Better Chases + Arrest Warrant contains a few modules that make the police of San Andreas more professional in their job of getting you, plus the revival of the old Arrest Warrant script, rewriten from scratch and with more features! Check the two first videos to see an example of how the script works. You can avoid being identified by wearing masks, helmets or driving a vehicle with tinted windows. Ducking inside a vehicle also works. No matter how high your Wanted Level is, you can surrender by pressing E while standing still, provided there is a cop nearby. PDF Guide, detailing the script features. Ingame menu to customize your experience (Default key: Add (+), changeable). 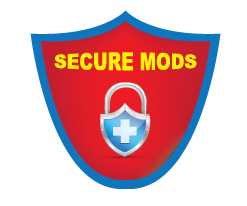 Both modules are compatible with RDE and FiveStaResponse. “Better Chases.dll”, “NativeUI.dll” & “BetterChasesConfig.xml” go to the scripts folder. If you don’t have one, create it. Q: Why are the both scripts merged into one single file? A: Performance optimization. 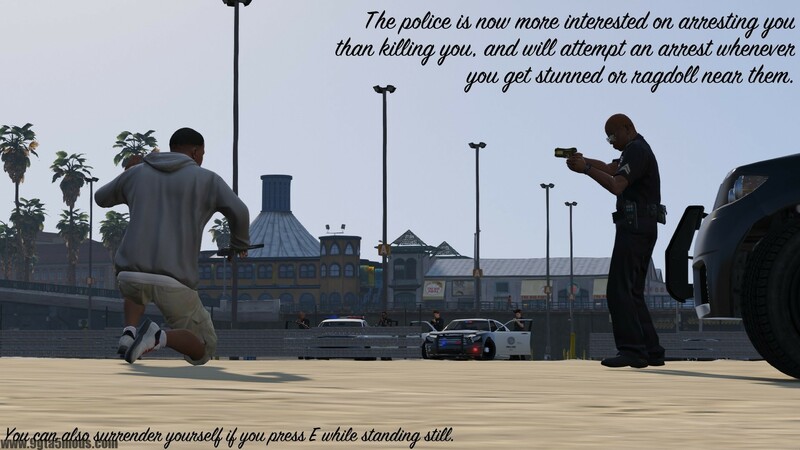 Both scripts work with police NPCs and calculate cop LOS to the player. Q: Can I disable one of the modules if I don’t want it? A: Yes. Use the Ingame menu (Add). Q: Does Arrest Warrant work with multiple characters? A: Sadly, no. If you change characters and get Wanted while an arrest warrant is active for the other character, it will be overriden. There are no plans on fixing this for now, it would be too complex to handle. Q: Is this compatible with Police Killer? A: No, sorry. 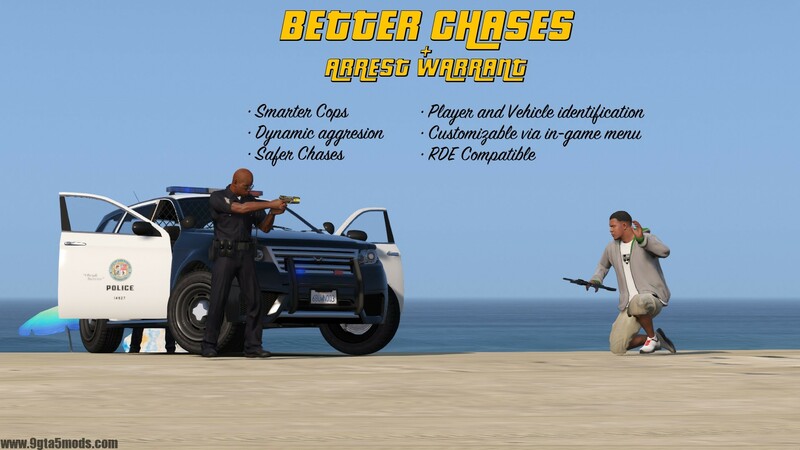 Both Police Killer and Better Chases take control over the Wanted Level and conflict. Q: Can you change the Arrest Warrant timer to Ingame time? So we can wait out the warrant by waiting ingame (sleeping, passing time in the hospital). A: Haven’t figured how to do it as of now. If I learn how it’s done, be sure it will be changed. Weapon removal when you are arrested. Special units for Better Chases. 1.1: Fixed masks for Trevor & Michael. 1.2: Fixed some typos and a crash issue wth SHV.NET 2.6.